Because Las Vegas is such a wonderful road trip hub, it’s sometimes difficult to look past all the world-class wonders within a weekend’s reach. With Zion, Grand Canyon, Yosemite, and Death Valley beckoning, why look any further for a quick and awesome getaway? Here’s one answer: Twentynine Palms, California. Not only is it the gateway to Joshua Tree National Park, it’s got a secret oasis where you can stay in a real adobe and eat food worthy of Las Vegas’s finest restaurants. You might even see a movie star. 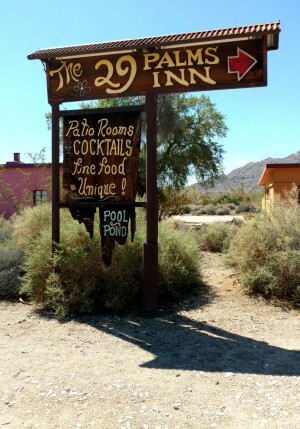 Okay, seeing a movie star might not be high on your list if you’re looking to escape Las Vegas glitz for a few days, but at the Twentynine Palms Inn, any movie star you might recognize would probably prefer that you pretend otherwise. Since the ‘20s, this has been a place to escape, to disappear and recharge. Writers have come here to write, painters to paint, and celebrities to disappear. Most, however, come to do nothing more than enjoy the solitude. 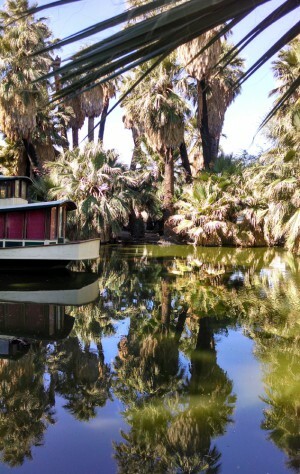 With an oasis and palm grove at its heart, this is an idyllic place to leave the city behind and soak up the wonders of the Mojave Desert. (Map). It’s also a great place to eat. Just off the swimming pool, there’s a small restaurant. When we checked in, we asked about dinner. It was a Monday night, and we were afraid the restaurant might not be serving. Then we wandered off to check out our accommodations. 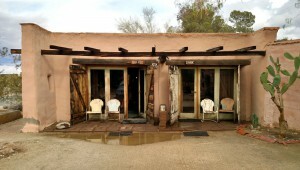 We had chosen “The Bottle Room,” which turned out to be a charming adobe with an open rafter ceiling and – yes – bottles set artfully into the walls. We were staying only one night, but I instantly wanted to move in for at least a month. After watching the sun go down over the palm grove surrounding the pond, we headed back to the restaurant. We were early for our reservation, and we were also in for a surprise. The restaurant was packed. Couples on dates, families with kids, girlfriends enjoying a night out – every table was full. We found two seats at the small bar at the back, right near the spot where a guitarist and mandolin player were playing and singing. By the time our wine had arrived, a bongo player had joined them. When our table was ready, we ordered from a menu equal to any restaurant on the Strip. The service and quality were that good, too. It was easy to see why the place was jammed, even on a Monday night. It must be difficult to get a reservation on a weekend. In the morning, after a delightful self-serve breakfast in the restaurant, we strolled around the grounds. A roadrunner streaked past, and we watched another bird build a nest deep inside the spiny branches of a cholla. At the west end of the property, we visited the art gallery and studio, where we watched two artists make monograph prints. The gallery sells work by local artists. Sadly, we had to leave after only one night. We saw a naturalist taking some other guests on a tour of the grounds when we checked out. Others were picking up bag lunches they had ordered from the restaurant. 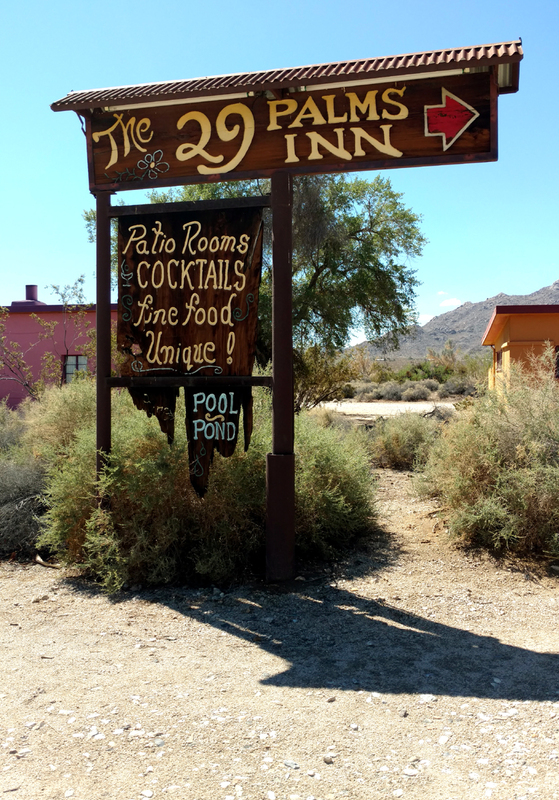 With its location right next to the entrance to Joshua Tree National Park, the Inn is the perfect place to stay while exploring the area. The restaurant was also open for “sit down” lunch, a tempting prospect. Not only is there a bakery on site – the sourdough bread alone justifies the drive to Twentynine Palms – many of the vegetables are grown in the Inn’s garden. We couldn’t stay for lunch this time, but maybe that was a good thing. We will, without question, be back for another – longer – visit. Sounds great! Makes me wonder if they have any ceramics studios there. It sounds delightful! My kind of oasis…charming accommodations and world-class food. Thanks, everyone! This is truly a special place. Mike, here’s a link that has more about the art gallery & studios: http://www.29palmsinn.com/artactivities.html. Yes, they do ceramics there, another reason to go back and stay a while. The Art Gallery is managed by one of the family members who owns the resort. A really wonderful lineup of several styles of art created by local artists. We have a new art installation in our garden created by one of these artists. 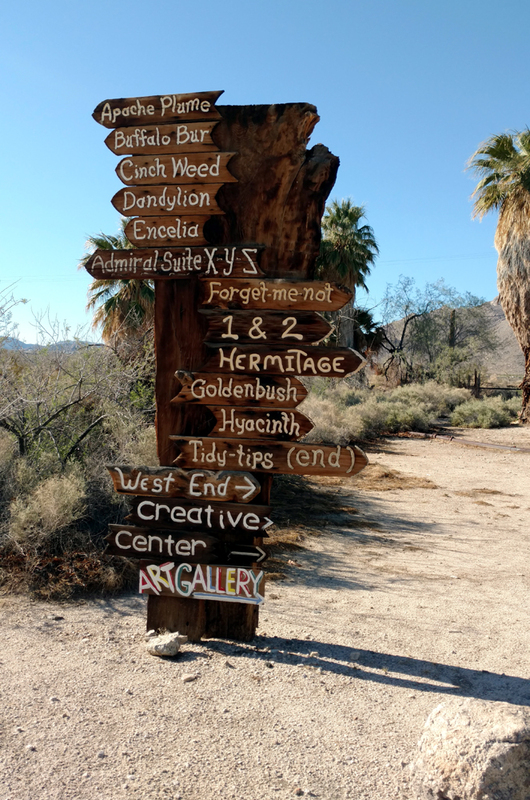 Twentynine Palms is also known as the Oasis of Murals — we’ve documented several of them over the years, on the RoadTripAmerica.com site. Here is an example of one of them.